Boat ramp etiquette is something every angler needs to understand. Whether that is how to back in your boat, how to get ready, and how to avoid altercations or frustrating other people. Unfortunately, if you’ve been to a boat ramp in the past couple of days, you know this is not common knowledge. 1. Don’t spend any unnecessary time on the boat ramp. Only get in line or go to the boat ramp when you are READY to be in line or at the boat ramp. You have plenty of time at home to prepare everything so make sure you are fully prepared, your rods are ready, and all rigging is done at home. Make sure you have enough lines to tie your boat up and know where they are located. Make sure your safety gear is good to go all PRIOR to coming to the boat ramp. 2. Pull into the parking lot–away from the boat ramp. Stay far away from the traffic at the boat ramp so that no one has to go around you. Doing this ensures you won’t interfere with anyone who is ready to go. This cuts down on boat ramp traffic and guarantees you time to double-check your boat, your gear, and MOST IMPORTANTLY – to put the boat plug in. The boat plug is the most important piece of fishing gear and the step you should always remember. (Even if you trust your winch really well, it is probably a good idea to have a bow line; take the bow line in one hand, and push the boat off the trailer with the other) Then, if you fall over because it is super wet, you won’t drift out to the middle of the marina. At this point, you have your strap off, and your plug in. If you’re not great at backing in, go and practice. Practice anywhere, until you can confidently back a boat into the ramp. A lot of boat ramps are big enough for two or three trucks, you want to be able to use one side or the other and leave room for someone else to use it. All that's left is putting the emergency brake on (very important), go unhook the winch cable, and off the boat comes. 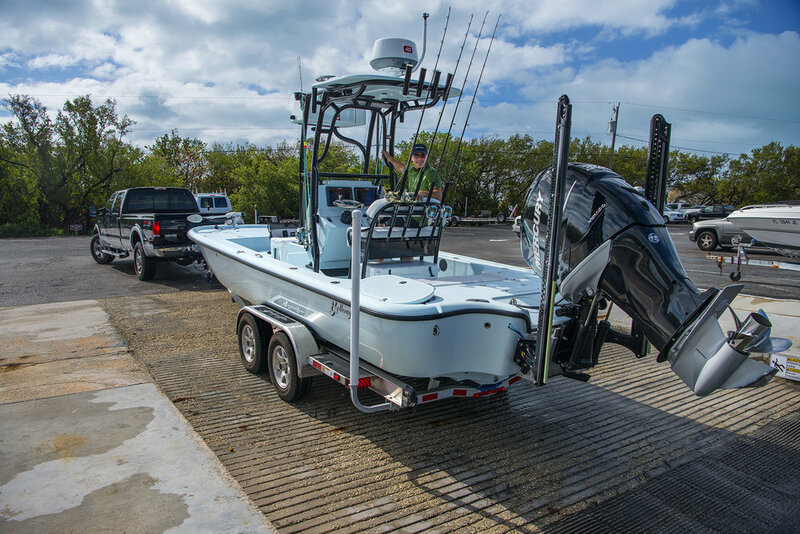 Then move your truck quickly and efficiently so you’re able to get to your boat and head out. If you have trouble backing in a boat trailer, definitely listen Tom Rowland’s Podcast for tips to practice. It certainly takes practice and is nothing to be embarrassed about in the least. Backing up a trailer is difficult, but with practice can be as easy as backing out your car.